Out of this, Ahmednagar will also have its share of openings. Candidates from this district can skim through this page and gauge whether they will be suitable for this position. We have clearly incorporated all the important details of the job opening which will be necessary for you to know before you apply. As mentioned above, there are 164 vacancies which are available for recruitment. But since the PDF hasn’t released yet, we will be unable to provide it right now. But we will soon be uploading the Ahmednagar Police Bharti Advertisement 2019 as soon as it is published. We would recommend that you apply online through the online application form as soon as possible. No candidates will be allowed to register for the Ahmednagar Police Bharti after the Last date to apply online runs out. The official portals where you can find all the necessary information are mahapolice.gov.in/Recruitment and mahapolice.mahaonline.gov.in. The Ahmednagar Police official website is ahmednagarpolice.org/wp/. You will find all the details of the recruitment here as well. These include Ahmednagar Police Eligibility Criteria and Constable Salary Scale etc. Find them attached below. Selected Candidates in this Ahmednagar Police Department Jobs, will get the pay scale of the 5,200 to 20,200 Rs. (Grade Pay – 2,000 Rs.) with Special Pay 500 Rs. and Other. Applicants’ First name, Middle name, Last name, Fathers name, Mothers name, Date of Birth, current active mobile number, photograph, signature and Adhaar card. How to Apply Online for the Ahmednagar Police Recruitment 2019? Begin this process by going to the official portal of the recruitment board-ahmednagarpolice.org/wp. Find the link which will help you apply online. Alternatively, you can proceed in a much easier way by going to the link below. Fill in the essential details listed above and attach the documents required by the system. Now, make the final online payment in order to finish the registration. You will now get a confirmation message on your registered mobile number. 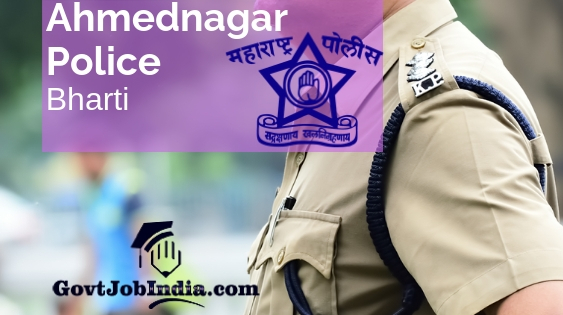 Apply online for the Ahmednagar Police Constable Recruitment 2019 as soon as the official start date commences. You can do this by bookmarking our page onto your favourite browser and you can check this page whenever there is a new update about the Ahmednagar Police Bharti. Furthermore, comment below if you liked this article and also comment in case you have any doubts. In conclusion, make sure that you are a regular subscriber of our website @GovtJobIndia.com and are able to view all our latest govt job recruitemnt across Maharashtra and other states of the ciuntry.